very valuable article, this is what I am looking for!. Thanks Glenn! Hey, no problem. I’m glad my post helped you. 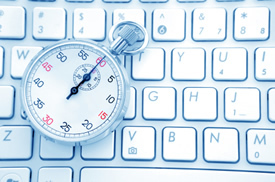 For certain situations, tracking elapsed time can be powerful. Nice article Glenn. You mention in the first paragraph tracking a multi-step process that spans several pages; is this feasible with the TimeTracker() wrapper? Or does changing pages break the continuity of the measurements? I was asked to measure elapsed time between someone putting something in a shopping basket all the way to getting a buy confirmation, with multiple pages in between. Ideally we’d like to measure the time spent on each page in between as well. Feasible? Thanks Michel. I’m glad you found my post helpful. I’ve always used TimeTracker on single pages to track how users interact with a process they are completing. For your situation, you might want to combine TimeTracker for completion time (on each page), and then use GA’s other time metrics to understand the total time to convert. It’s not perfect, since the final page will have a time of 0:00 if they simply exit the site at that point. But, it would give you more data with regard to time both in-process and then between pages. I hope that helps. Does this function work only during one visit? What if user starts the process during first visit and completes during the next one? is it possible to track it somehow? Alla, this can be used for tracking session-based processes. The timer will get wiped out when a user closes the browser window. I hope that helps. Thanks David. I’m glad my post was helpful. This could work for the scenario you listed above (if each step is on the same page). You can start to learn how long it takes between steps, and then get an overall feel for the entire process (time-wise). Let me know how it works for you. but I have one question. I would like to give an action name rather than those time intervals. how can i dod this ? David, the setHistogramBuckets() function takes numbers as arguments. You should try out adding actions in quotes, but I’m not sure that will work. The function will probably fail. Let me know how it works out for you.